Families have trusted Toufayan to bring them the best tasting, healthiest breads possible. That’s why families have found our fresh baked bagels so irresistible. Our five tempting flavors and four different pack sizes are sure to offer the right combination your family is looking for. With at least 8 grams of Protein, 0g Trans Fat and 0mg Cholesterol, Toufayan Bagels are the healthy bread you can feel good about serving. 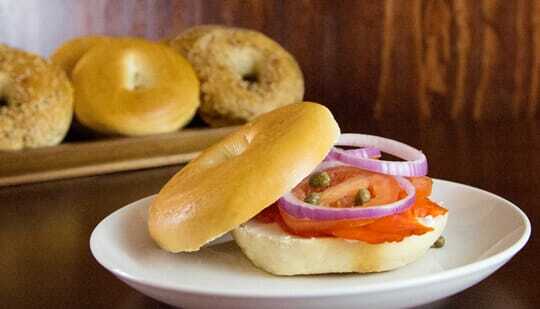 We know your family will love the unbeatable fresh taste and texture of Toufayan Bagels. I found your toufayan whole wheat bagels by accident in a store in stockbridge, ga and really, really loved them. Now, I can’t find them and can’t figure out where I can purchase them .I wish that I had an order form with the bar code on it to see if a can have my store more conveniently order them. It’s hard for me to find a great whole wheat bagel of that quality . Please help me able to purchase them all of the time. We don’t distribute a lot of bagels in GA, but you should try Winn-Dixie (they usually stock our Smart Bagels), and Publix carries many of our products. Please ask your store manager to contact us to order more Hearth Baked Bagels. Tried your bagels as an alternative to that other brand. They are great but no raisins in the firs 2 I tried. Shall I send down some? Hello Lloyd, thanks for trying our Hearth Baked Bagels. We’re sorry to hear there were no raisins. Can you tell us what store sold them to you? We’d love to tell our QC department about your experience. Thank you so much for your feedback. We will definitely look into our quality control. It would help if you mention what store you bought them at. In any case, we are grateful for your response. At home, I occasionally freeze our bagels and they defrost quite well for us. The key is to chill them first, at least 20 minutes to an hour in the fridge before freezing them. Also, make absolutely sure that they are well sealed with as little air as possible before chilling or freezing. Even a little moisture or condensation can make them become stale very quickly. When you defrost them, leave them at room temperature for a few hours, do not heat them from frozen. The bagels can remain frozen for up to 3 months if well sealed, but once defrosted you should use them within a day or two. My name is Patrick from Dominican Republic. I would to know the distributor’s name in my country. Hello Patrick and thank you for your interest. The code date should be printed by your grocer, sometimes on the bag and sometimes on the twist-lock. Toufayan heath baked bagels are meant to be coded for 5-6 days after defrost. Where can I find your bagels? I’ve tried at the locations you have posted but they don’t carry them. I live in Lansing, Illinois near the border of Indiana. Thanks. Hi Taylor and thank you for your interest. There aren’t any grocers in your region that carry our bagels, right now. Please ask your favorite grocer to stock Toufayan Heath Baked Bagels! Meanwhile, some of our products have made their way onto the internet and you may be able to find them with an online search. Let us know if you do use an online store, so we can help advise your neighbors too! We are sorry for your experience. Please tell us what store you purchased these from or if you still have the packaging. You may also contact a Toufayan representative directly at info@toufayan.com. I was looking at purchasing Hearth Baked Classic Plain Wraps, the Everything Smart Bagels, the Hearth Baked Blueberry Bagels and the Hearth Baked Classic Plain Mini Bagels. However I noticed that they all have Mono-and-Diglycerides listed in the ingredients and I was wondering if these are from an animal or vegetable source? Our bakers assure us that any Mono-and-Diglycerides used in all of our products are purely vegetable-based. Enjoy it in good health! Where can i buy your sweet onion bagels in Holland or somewhere in Europa? Hello Lisa and thank you for your interest! Currently, Toufayan Bakeries does not ship to Europe. However, some of our products have made their way onto the internet and you may be able to find what your looking for on major shopping sites or on your favorite search engine. Let us know what you find, so you can help your neighbors too! Are your mini bagels peanut free? how do i know an expiration date for bagels? Your grocer should code Toufayan Bagels with a 5-6 day shelf life. Different grocers mark their packaging in different ways, you can check with your store’s manager for more details. I love your gluten free wraps but I long for a bagel. Do you have any plans on making and distributing gluten free bagels in the NewJersey/New York area? Hello Debbie. We do hope to bring you a gluten free bagel as soon as we can. However, we can’t promise when because we are working to create a flavor and texture that adheres to our standards of satisfaction, value and wholesomeness. We’ll do our best to create the perfect recipe just as soon as we can! You can look for the latest news on our products here, and check out our family of of product classifications here. Feel good about this healthy, tasty lunch that's perfect for school or work, courtesy of supergluemom.com.